R ain gardens are plantings that are specifically designed to soak up rain water from roofs, from driveways, parking lots, and lawns. When it rains, the rain garden fills with a few inches of water and allows the water to slowly seep into ground filtering out pollutants such as fertilizer, pesticides, and oil, rather than having it run into the waterways or storm drains. This purifies the water and lets it replenish the aquifer rather than having it flow unfiltered into streams, lakes or the ocean. The ground should not remain wet, but should dry in a day or so of fair weather. It is planted with native shrubs and flowers that can tolerate wet or dry conditions and add to the beauty of the neighborhood and attract wildlife. WHERE DO YOU FIND A DEMONSTATION RAIN GARDEN? The Ewing Municipal Building has a rain garden created by the Ewing Green Team in 2010. The spot was chosen near the parking lot in front of the soccer fields. Water now flows from the parking lot into the garden after storms. An informative explanation has been posted to educate the public. The Senior Living Center on Whitehead Road Extension in Ewing also has a successful rain garden. You can build your own rain garden at your home to collect water runoff and store it, permitting it to be filtered and slowly absorbed by the soil. The interception of water runoff from impervious surfaces will not only beautify your landscape but also act to minimize the volume and improve the quality of water entering conventional storm drains and nearby streams and minimize soil erosion. It will also help you provide a habitat for wildlife which can be sorely lacking in home gardens. And finally, the volume and quality of water is better whether it is absorbed in or leaves a rain garden. The Ewing Green Team will run annual Rain Garden Workshops in conjunction with the NJ Watershed AmeriCorps Ambassador Program. 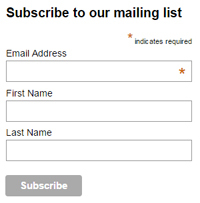 Check our calendar for more information. If you are unable to attend our workshop, Rutgers University offers extensive training for landscapers, Master Gardeners, Environmental Stewards, Master Naturalists and community environmental groups who can then provide outreach to their communities. 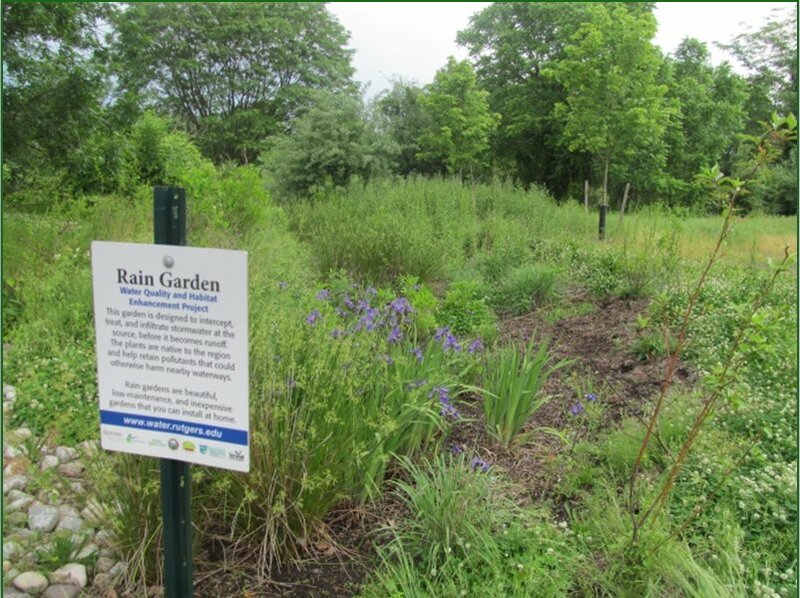 The Rutgers Rain Garden Manual is available here. You can take an active role in reducing flooding and pollution in local waterways by installing rain barrels at your home. Install rain barrels under your gutter’s downspout to harvest rain water from your roof. Each rain barrel holds approximately 50 gallons. You can install them singly on hook them up in tandem to reserve even more water. Use the water to save money and save water when you irrigate your gardens with it during times of low rain. Rain barrels are for sale at local garden centers or are easily constructed from materials such as plastic garbage cans. If you are not so handy you can attend a rain barrel workshop that will save you money over purchasing ready made rain barrels. 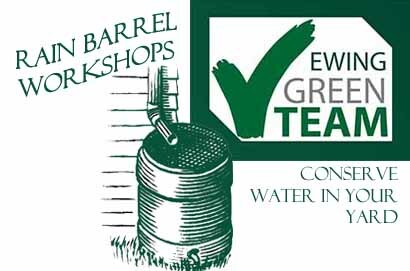 The Ewing Green Team offers periodic workshops to teach Ewing residents about important water conservation issues and how to construct and install rain barrels in conjunction with the NJ Watershed AmeriCorps Ambassador Program. There is a fee to cover the cost of the materials. For more information about the 2014 workshops and to sign up go to http://www.signupgenius.com/go/10C0D4EAEA82CA4F49-rain. Availability is limited (20 registrants per session). Prepayment and advance registration is required. Sign Up now or call 609-883-0862 for more information.